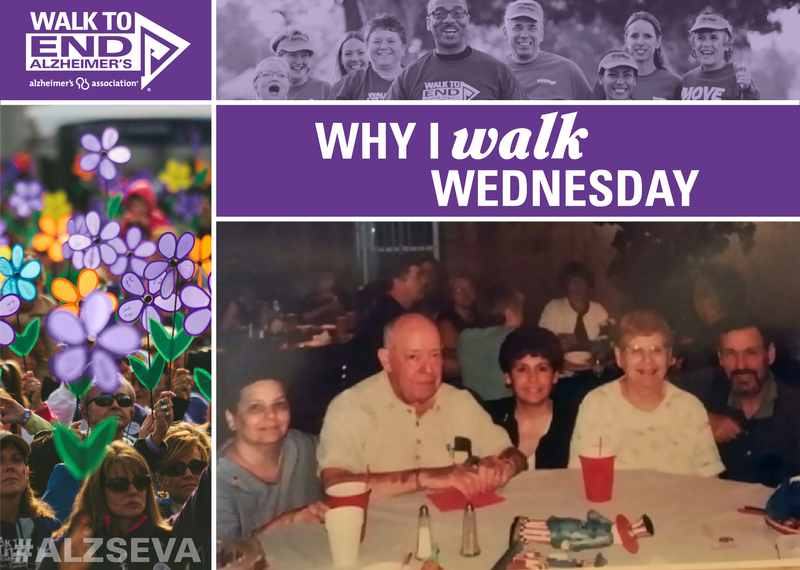 Why I Walk is a totally different reason today than it was 8 years ago when my true friend, mentor and Mom, Clara, was diagnosed with the onset of Alzheimer’s. This ugly disease took my close knit family’s life and turned it upside down. How could this be happening to the one person who kept us all together? Six weeks later, Dad (Izzy) passed away. Mom was placed in a nursing home where we had relatives that worked and we knew she would be looked after. It was difficult for me to leave but I had to come back to Virginia and care for my family here. But decisions still had to be made long distance for Clara. Even though there are 2 others at home, a brother, Willy and my sister, Susan. It was Susan who took on the burden of the everyday laundry, visiting on her lunch breaks and 2-3 times a week in the evenings; taking mom home on weekends so she could get out of her apartment (as Mom has come to call it) as often as possible. Guilt set in for me. Each day I would phone my mom while she still knew who I was and could talk to me but that wasn’t enough for me. I would speak with my brother and sister and of course my sister was most frustrated with all the running around she had to do. I still try to go home 4 – 6 times a year to give Susan a break but that still isn’t enough. Over the years Mom has changed, she repeats herself and can’t remember much of anything except growing up and we love to hear her stories as we find out that she did some pretty cool things herself. We have to continue to tell her who we are and then she asks if she ever had children? Lately she doesn’t want to leave her home anymore. I still go home as often as possible but I feel like I go home more now for my Siblings to give them a break, especially Susan. So now I walk for the families that live away from their loved one and have to feel the guilt as I. Those who can’t seem to walk fast or far enough to raise the funds to get the research to find the cure before we have to place our loved ones in nursing homes and our siblings have to give so much of themselves to care for them.